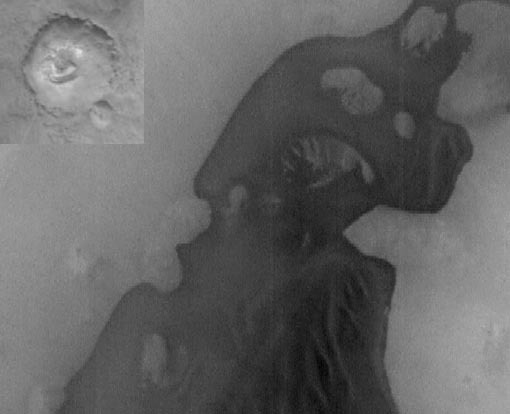 Explanation: Did a pond once exist in this Martian crater? Recent photographs by the spacecraft Mars Global Surveyor, currently in orbit around Mars, show features unusual for Mars yet similar to a dried pond on Earth. Previously, much evidence suggested the effects of ancient channels of flowing water on Mars, but less evidence had been found for dried pools of water. Islands and bays on this crater floor indicate an accumulation of some liquid, however, a hypothesis consistent with channels found on the (inset) crater walls. As it is also possible the features were formed by other mechanisms including flowing lava, future observations and analysis will be needed to say for sure.